Sunrise Calendar. 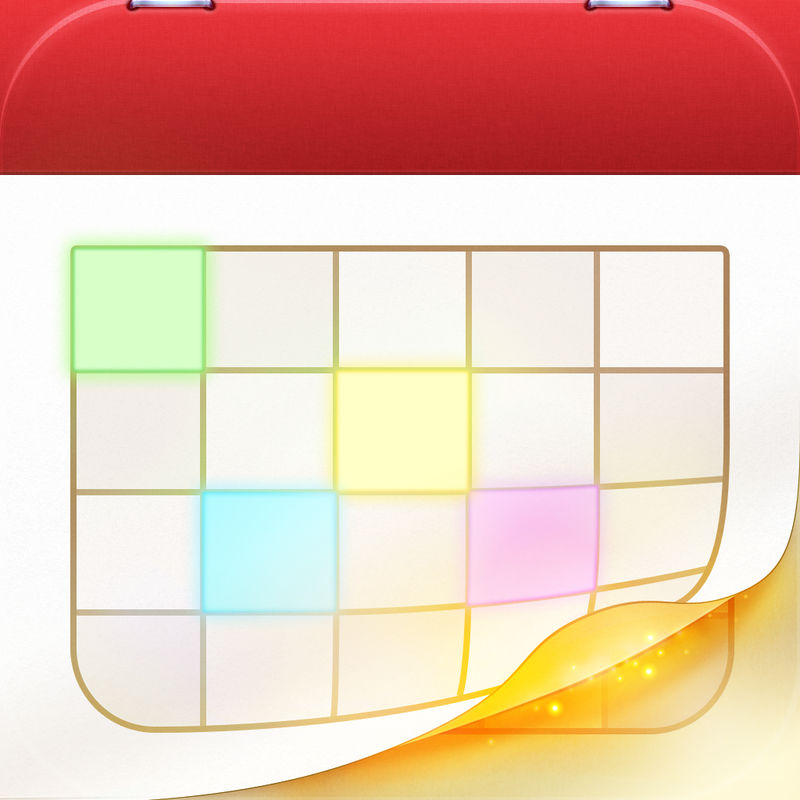 (Free) by Sunrise Atelier, Inc. is a slick calendar app for Google Calendar users. 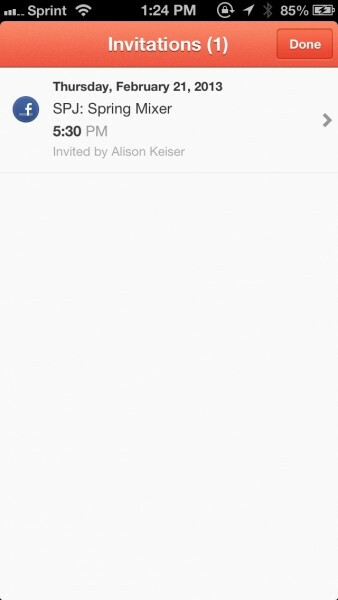 If you were never satisfied with how iOS handles Google Calendars, as well as the many calendar apps that fetch data from your device, such as Fantastical and Agenda, then Sunrise is worth checking out. I noticed Sunrise because of the sleek interface. 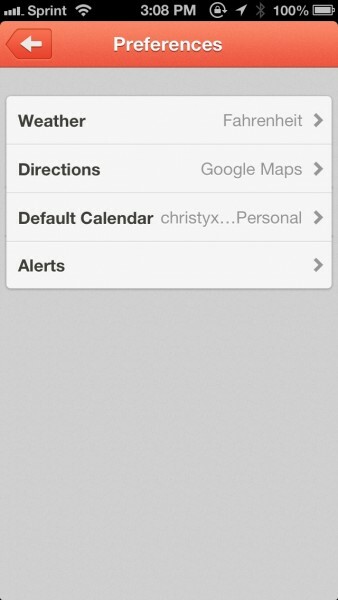 It kind of reminds me of Path, in a way, because of the timeline view it uses. The orange is a nice shade as well, and reminds me of Cheddar. 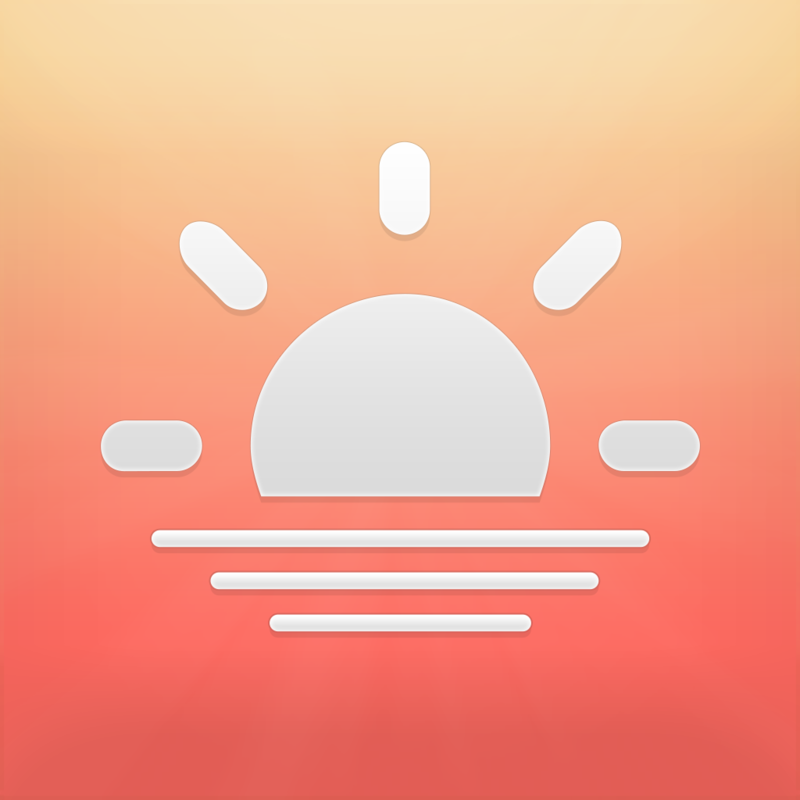 Overall, I was impressed with the visual interface for Sunrise, especially considering that the app itself is completely free. 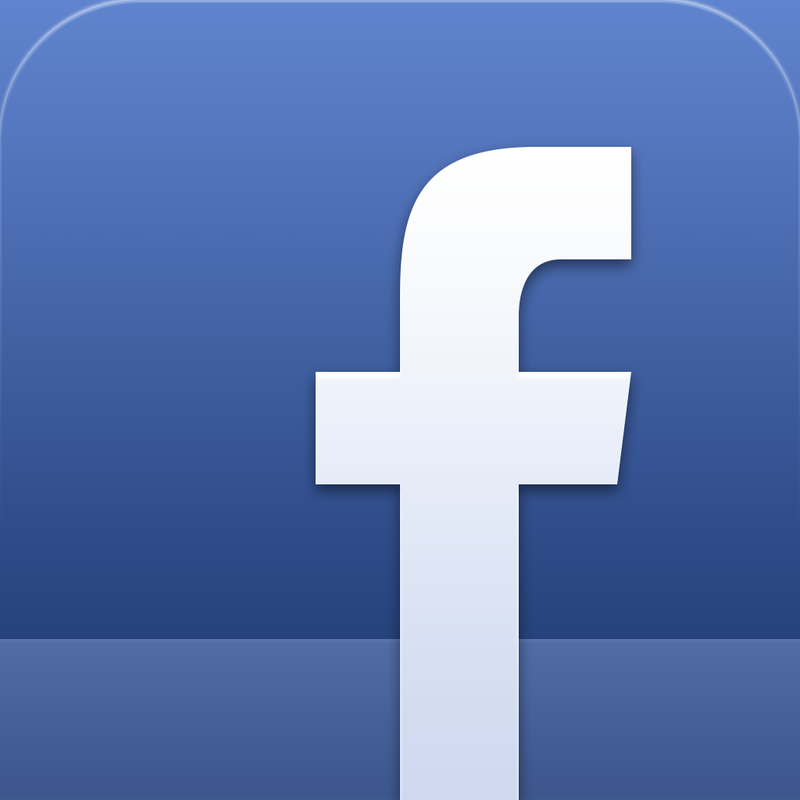 To get started with using the app, you will need to log in with your Facebook account. Unfortunately, there is no way around this, which is a shame. If you do not use Facebook, you won’t be able to use the app. I hope that the developer comes up with a way to make this optional, because let’s face it — not everyone wants to rely on Facebook Connect. 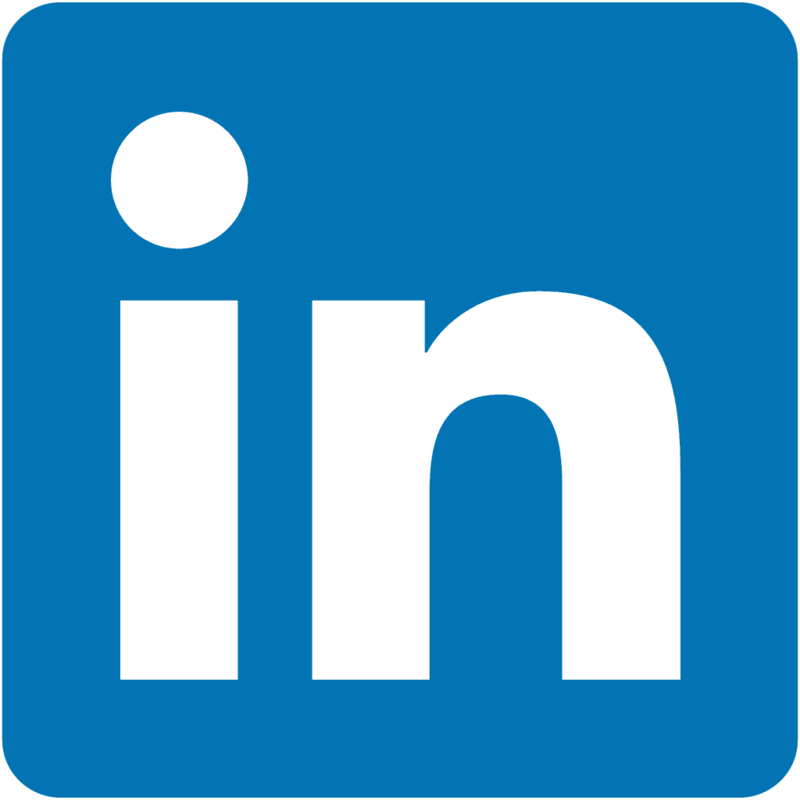 But if you do log in with your Facebook, the next step is to add your Google Calendar account, and optionally, even your LinkedIn credentials (I never use LinkedIn for scheduling, so I skipped this). 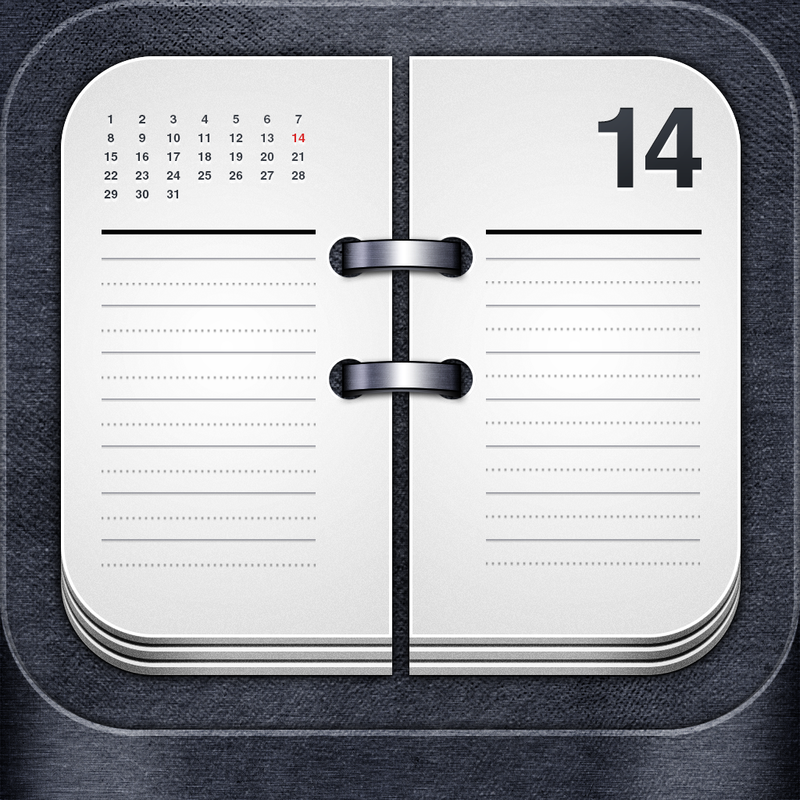 When it is done authorizing, you’ll get a sleek calendar screen. The top half of Sunrise will feature a two-week view of days. If you pull down on it, you will reveal the entire month. 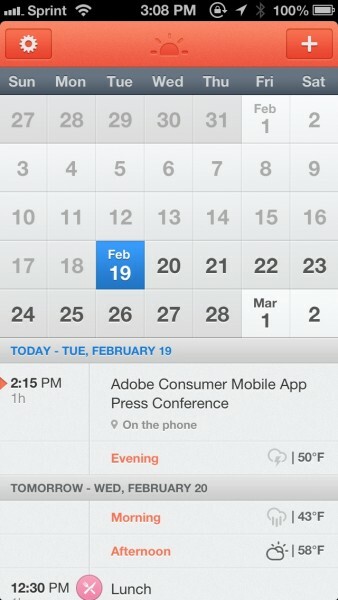 Today will be highlighted with a dark gray color, and any selected day will be highlighted in blue. 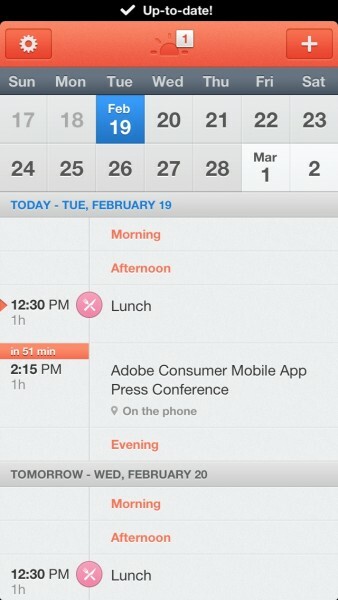 The bottom portion of Sunrise will feature an agenda view, where your upcoming events are shown. Sunrise will also split up events in the morning, afternoon, and evening, as well as displaying the overall weather condition and temperature for that specific part of the day. I did like the fact that Sunrise uses a fork and knife icon if you have events like “Lunch” or “Dinner” in your calendar. These help make the events stand out. Other events will use a dot (represented with the calendar color you have selected), and birthdays will have gift box icons. You also get indicators of events happening now, and markers with time left until the next event, which are handy. 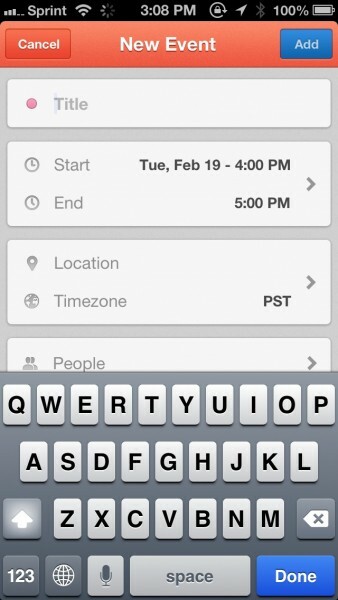 When you want to create a new event for your calendar, just tap on the + button. 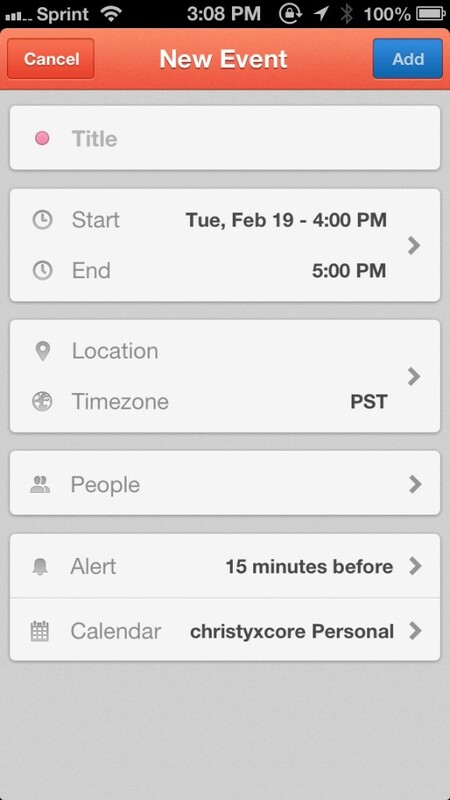 Users are able to enter a title, pick start and end times (or all day events), location information, timezone (nice addition), send invites to others, choose alerts, and select the calendar to add it too (if you have multiple calendars, of course). 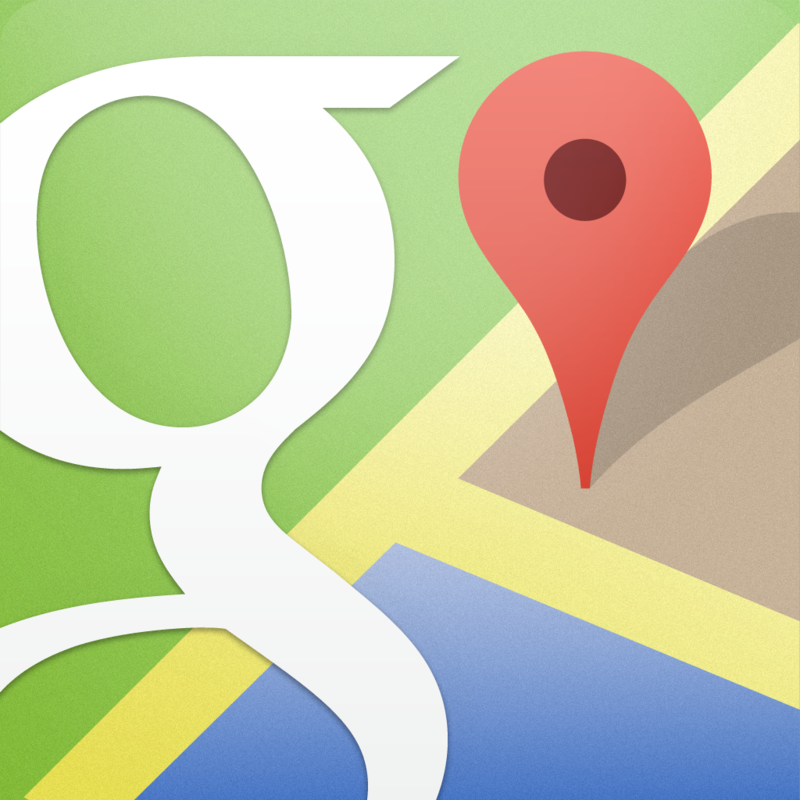 If you always preferred to have the powerful features that Google offers for calendaring, then you will like the options that Sunrise offers in the app. 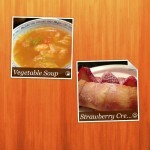 The app automatically syncs any changes and refreshes information whenever you edit an item or come back to the app. 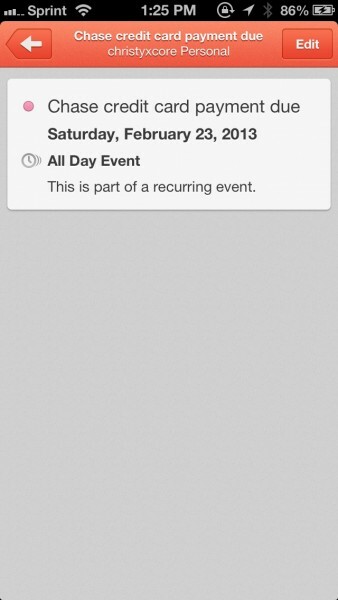 You can also tap on the “sunrise” at the top of the app to access any Facebook event invitations you have pending. The app’s settings allow you to toggle which calendars are displayed, what notifications you should receive, and preferences for weather, directions (Apple or Google Maps), your default calendar, and default alert times. 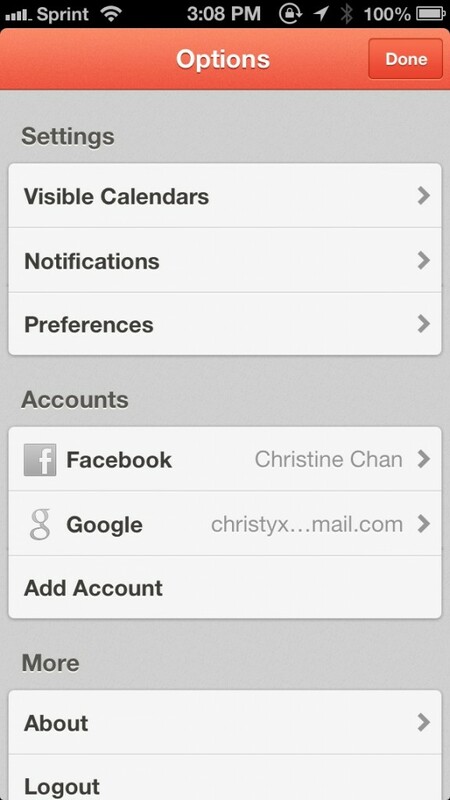 You can also add multiple Google Calendar or LinkedIn accounts, but you will always need one Facebook login. I’m enjoying Sunrise Calendar so far, as it packs all of the powerful features of Google Calendar in a sleek interface, and comes with some great customization (picking your default maps application is slick). However, the biggest problem is the mandatory Facebook login in order to use the app to begin with. This should be changed as soon as possible, and until then, I can full recommend the app for all Google Calendar (or LinkedIn) users. Until then, it’s still a good option, if you don’t mind logging in with Facebook, anyway. 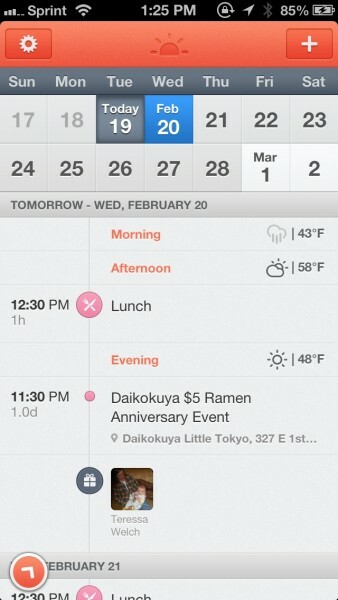 You can get Sunrise Calendar for your iPhone in the App Store for free.